If music is your bag, then the HTC Desire 10 Lifestyle gives you flagship quality playback at a fraction of the cost. Can you hear that? It's the sound of a smartphone offering best-in-class audio – at least that's what HTC wants you to believe with its latest mid-range marvel, the HTC Desire 10 Lifestyle. The phone arrives as one half of a double act, with the higher-spec Desire 10 Pro taking most of the limelight, and with it a higher price tag, while the Desire 10 Lifestyle takes the trendy, lower-cost route in search of underground fame. Is the audio experience alone really enough for the Desire 10 Lifestyle to stand out from its other half though? The Lifestyle misses out on a fingerprint scanner, 1080p resolution, flagship camera, laser auto-focus and two-tone flash – all of which the Desire 10 Pro has. 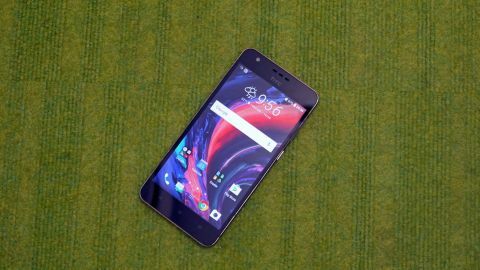 The Desire 10 Lifestyle isn't void of features though, and with a lower price tag to its name there's still a good chance it'll stake a claim in the mid-range market. The HTC Desire 10 Lifestyle's release date is currently unknown, but with the Desire 10 Pro scheduled for an October arrival we expect the Lifestyle to show up around the same time. Whether you'll be able to choose between the Lifestyle and Pro in your country remains to be seen, as HTC has yet to confirm which countries the two phones will be landing in, but we do know the Lifestyle will be coming to the UK, while the Pro will not. In the UK the HTC Desire 10 Lifestyle price has been set at £249 for the 3GB/32GB variant, which makes it rather attractive. We're still waiting to hear prices for the rest of the world, but a HTC spokesperson told TechRadar that we can expect a sub-$300 (AU$400) price tag in the US. There's a pleasingly premium finish to the Desire 10 Lifestyle, with the soft-touch polycarbonate body strengthened by a metal frame beneath – but while the metal is premium, it's the polycarbonate that has a warming presence in the hand. The phone grips nicely against the palm for a comfortable hold, which is useful seeing as this is a pretty big handset at 156.9 x 76.9 x 7.7mm, although at 155g it's not as heavy as you might expect. You can pick up the Desire 10 Lifestyle in four colors: black, dark blue, light blue and white – and all have a golden metal frame as an accent throughout the design. Up top there's a 3.5mm headphone jack, while on the base of the handset you'll find a micro USB port and a bass speaker, which works in unison with a standard speaker at the top of the phone. This is the same BoomSound Hi-Fi Edition speaker setup you'll find on the flagship HTC 10. The screen is a 5.5-inch offering with a 720p resolution, although there's not a great deal of difference in clarity between the Lifestyle's display and the one on the 1080p Pro. Hi-Res audio is the order of the day with the Desire 10 Lifestyle – whether you're using the built-in speakers or plugging in a set of headphones, HTC wants to give your ears the best experience. The built-in HTC BoomSound Hi-Fi Edition speakers include a separate tweeter and subwoofer. The former is located at the top of the device with the earpiece, while the subwoofer resides on the base of the handset. This means that high-frequency sounds and bass tones are separated, supposedly delivering something closer to Hi-Fi sound than phone speakers can typically manage. Crank the volume up on your favorite track and the Desire 10 Lifestyle produces room-filling audio that's a far cry from the distorted mess you get from a lot of smartphones. The bass isn't going to be shaking your light fittings, but it is more noticeable than on rival handsets. Plug in headphones and music sounds superb, especially if you have access to Hi-Res tracks. We listened to a couple of tracks during our hands-on time with the Desire 10 Lifestyle, and can confirm that the playback quality will please audiophiles. The HTC Desire 10 Lifestyle features a Snapdragon 400 processor, a chip usually found in entry-level devices, and we're a little disappointed to find the phone's not packing the mid-range 600 series. The processor is coupled with either 2GB or 3GB of RAM, depending on whether you opt for 16GB or 32GB of internal storage, and given the choice we'd certainly recommend the 3GB/32GB variant for slicker performance and more space for your apps and games. If you can only get hold of the 2GB/16GB version of the Desire 10 Lifestyle you can at least expand the storage, as the phone has a microSD slot which supports cards up to a whopping 2TB in size. Android Marshmallow ran smoothly during our brief time with the phone, although a few apps did take a little while to load. The handset we were using wasn't running final software, so things could improve before it hits shelves, but we fear the phone may struggle a little with high-intensity gaming. On the back of the HTC Desire 10 Lifestyle you'll find a 13MP camera, which is capable of taking some rather nice shots, and should suffice given the phone's mid-range price tag. Around the front a 5MP camera awaits for all your selfie needs, complete with a 'live make-up' mode if you're having a bad face day. The Lifestyle is powered by a 2700mAh non-removable battery, which HTC reckons can give you up to eight hours of HD video playback or up to 50 hours of audio playback – which is a decent amount of time if true. Thanks to fast-charging support the phone should be able to juice-up quickly as well – we'll be sure to put the battery through its paces in our in-depth review very soon. If music is your bag, then the HTC Desire 10 Lifestyle gives you flagship-quality playback at a fraction of the cost of other similarly-equipped phones, and for some that's great news. The thing is, though, the Lifestyle will only likely appeal to a small segment of the market, with the Desire 10 Pro enjoying wider appeal and rival handsets likely offering more well-rounded experiences for a similar price. We're intrigued to see how the Lifestyle fares.